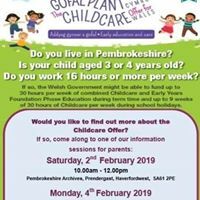 In April 2019 Pembrokeshire is joining the 30 hour childcare offer for Wales. This will entitle working parents of 3 year olds to financial support for 30 hours of education and childcare . Details will follow but information sessions are to be held as follows. Happy Days will shortly be outlining how the scheme can be accessed at our sites.